The Confederated Salish and Kootenai Tribes added StrandVision Digital Signage to reach employees, Tribal people and the public. 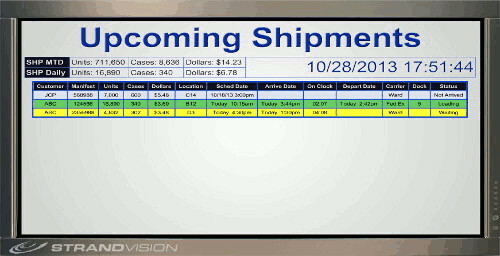 StrandVision Digital Signage now offers digital signage background templates along with enhancements to allow subscribers to personalize backgrounds even more to create a consistent business marketing look across their digital signage network. Enhanced electronic signage database capabilities offers powerful new features to help its customers display dynamic digital signage content as well as providing custom database design and integration services. 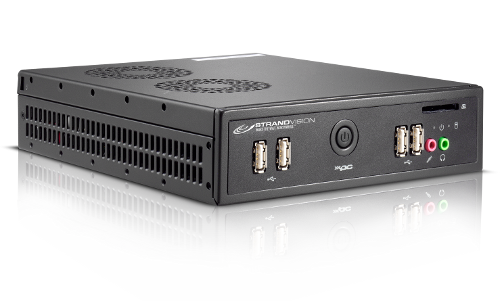 StrandVision Digital Signage and Shuttle Computer Group, Inc. announces a low cost, powerful digital signage media player taht is preloaded with StrandVision electronic signage software and adds several features. As part of the 10-year anniversary, StrandVision is offering no charge digital signage background music ($750 value) to its existing and new customers. This one-time offer enables subscribers that sign up on or before December 31, 2013 to add digital signage background music content permanently at no charge – for as long as they keep their digital signage network active. The new mobile digital signage network monitoring uses familiar stoplight icons to give signage administrators easy, instant electronic signage network status updates at a glance. StrandVision celebrates ten years of digital signage excellence and looks back on how the electronic signage industry has changed and the tremendousopportunities for the future. Free, no registration PowerPoint to JPG conversion service lets users develop basic digital signage content for playback on appropriately configured flat screen television, digital photo frame, PC or tablet to play the slide loop. 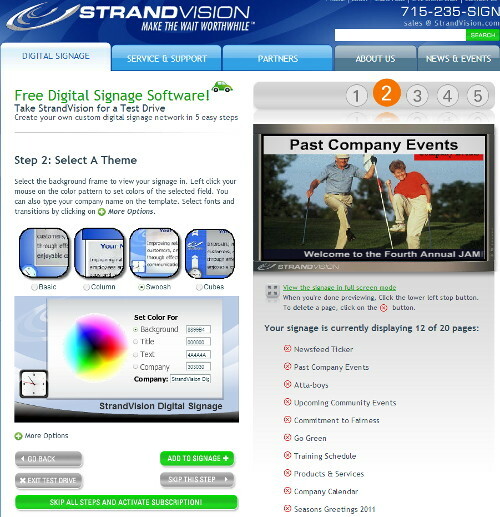 StrandVision Digital Signage now provides a free digital signage feature that allows automatic override of normal digital signage content to provide regularly scheduled employee communications including employee training and certification material, announce upcoming employee meetings and other important employee communication messages. A free digital signage world weather service app is available immediately to all international weather users of the StrandVision Digital Signage network. Manzano High School opens a new parent and student communication channel with StrandVision Digital Signage on a Mac digital media player. StrandVision Digital Signage has reduced its monthly electronic sign subscription costs by twenty percent with the new monthly automatic payment system.